I want to share with you a little-known feature in Outlook that you might not be aware of: it’s a task timer! It’s a little out of the way so I’m going to show you where to find it. First, go down to your Outlook task bar in the lower left and click on those three little dots. This brings up the Journal timeline. This is where your journal entries are saved and appear. When you’re ready to use the timer, click on “Journal Entry” there in the top left. This is where you find the hidden task timer! Now, fill in the details of your task or activity. First, select an entry type. I tend to use “Task,” but you have several options to choose from. Then give your entry a good description. You’ll see that the date and start time are already filled in for you. There’s a big note section below that where you can type anything you like. There’s also a company field where you might want to type in a client name (or, alternatively, you can start your description with the client name like I prefer; either way, you can play around and do whatever works best for you). Once you’re ready to begin whatever it is you want to track the time on, simply click “Start Timer” and away you go. When you wish to end recording, click on “Save & Close.” This will stop the timer and save the entry to the Journal timeline. To check the recorded minutes, go the timeline and click on the entry to open it. The total minutes recorded appear in the “Duration” field. And that’s it, easy peasy! If you’ve followed me long, you know that I’m an advocate for ditching the timesheet, stopping the clock-watching and task-timing, and selling value-based solutions instead of hours. So, in sharing the Outlook timer with you, I’m not suggesting you start tracking all your time and tasks for clients. That just creates bigger administrative headaches, makes your business and billing more complicated and time-consuming, and limits your earning potential on top of everything. However, there are certain instances when timing things is useful. Sometimes, for your own internal use and frame of reference, you want to get an idea of how long certain common tasks or activities take you on average. You also might want to track time when you are doing work that is separate from and not included in a client’s support plan. For example, I work with attorneys and charge them a flat monthly fee for a body of administrative support. However, there are limitations to that support, one of which is litigation. One of the activities that is sometimes (not always) needed in litigation is transcription. A lot of times, an opposing party will provide pleadings in an uneditable format that a client must respond to. If we can’t get them to send us an editable version (like Word) and OCR conversion won’t work or would be too time and labor intensive to clean up (quite often it’s easier and takes less time to simply retype something from scratch), that’s when transcription is needed. However, transcription times can vary greatly, obviously. So, for work of that nature, that is outside the normal scope of a client’s regular monthly support plan, I use the Outlook Journal and timer to keep track of these additional activities so I can bill for them at the next invoicing. So, I’m curious… did you know about the timer in Outlook? If not, do you think it will come in handy now for you? Let me know in the comments! 7 Comments Posted in Accounting & Bookkeeping, Billing, Business Management, Outlook, Tools We Use, Video. Bookmark the permalink. Last year, Intuit discontinued its Intuit Payment Network (IPN), which was a convenient way to collect payments from clients inexpensively (only 50 cents per transaction). Plus, even though it was a great option for receiving payment electronically from clients, there were some minimum financial benchmarks to meet in order to qualify for the service so it didn’t work for everyone. Paypal is a handy, extremely easy-to-use backup and while any fees you pay are a business write-off (so I don’t sweat them), it still would be nice to have another IPN alternative. So I was definitely interested when I received an email from my bank about a third party service called Viewpost. It works with any bank in the U.S. There are no minimum financial qualifications or balances to meet to sign up and use the service. Clients can pay with bank account or credit card (all my clients prefer credit card because their payments to me earn them a significant amount of travel miles, hotel and cashback rewards). During the sign-up process in Viewpost, you’ll also have the option to sign up with Stripe which is the service that will give you the additional functionality of accepting credit card payments. If you sign up for Viewpost only, payment will only be bank account to bank account. You are not charged for any payments you receive through the service. For clients to pay you through the service, they will also need to set up an account. However, this is a one-time process and they can then use that account with other vendors as well as for themselves and their own clients if they so choose. All said and done, it’s still worth trying out as it would be nice to keep more of my own well-earned payments myself. Better yet, ask your bank if they already partner with Viewpost and ask for their special link/sign-up page as there might be some special advantage to doing that. I received my invite via my bank and there is a special $25 Amazon gift card sign-up bonus right now. Have you used Viewpost before? What was your experience with it? Any other Viewpost info or tips you can share with us? Do you know of a similar service that only charges 50 cents per payment transaction? Well, this has turned out to be a bit of a no-go for me. It occurred to me to ask about accepting credit card payments. I have most of my clients on auto-pay (where they sign an agreement and I process their payments to me automatically each month), and most of them prefer paying by credit card because they want the airline/travel/hotel/cashback points and rewards. I was informed that you can only accept credit card payments by using Stripe (which the Viewpost sign-up process has you sign up for as well) and their regular merchant account processing fees (I think they said it was roughly 2.9%). I was also told that it would take anywhere from 2 – 7 days for those payments to actual process and be available to me. And while the bank-to-bank account payments through Viewpost, even though they would only cost 50 cents to the client who is paying, those would also not resolve for 2 days and could take as long as 10 days to finalize. So that was all a deal breaker for me. Why would I switch to a new system that creates more work and rigamarole (for me and my clients) and no cost savings when I can already have a system in place with the ease and convenience of instant payment with Paypal? Sure, I might pay the same fees to PayPal, but you’re going to pay the same (or more) to any merchant account service and the ease and convenience and instant availability of my funds is worth it to me. Plus, any fees you pay are a business write-off so I’m not worried about them. They help reduce my taxes. Still, as with anything, there’s always a positive side. Now I know more about this particular service and even though it’s not right for me and my clients currently, there still might be some odd occasion where it can be handy, either for me or for one of my clients. 2 Comments Posted in Accounting & Bookkeeping, Billing, Getting Paid, Money, Tools We Use. Bookmark the permalink. Dear Danielle: Do You Use PayPal? This was a question posted in my private Facebook community last November. With Intuit Payment Network (IPN) ending next month, it seems like a good time to revisit the topic. Yes, I use PayPal as a payment processor, but I invoice clients with my customized invoice in Quickbooks Pro (which is the comprehensive software program where I do all of my bookkeeping). I’ve been using PayPal since 2000 and have never had a single problem. It’s super easy to use, integrates quickly and easily with web coding, and it’s established and trusted. A merchant account is an alternative to PayPal, but I’ve always found them more complicated to use, and not necessarily any cheaper, and in my experience, you don’t get the same level of tech support that PayPal provides. Personally, I could never be bothered with using them, and when I was still in the web design business way back when, I hated trying to integrate their coding onto websites. So convoluted and difficult and they don’t necessarily care about providing more than a superficial level of support. Maybe that’s changed. And of course, I have programmer now that I let handle that kind of work when it comes up. The other payment processor I use is IPN which is Intuit Payment Network:https://ipn.intuit.com/. IPN only charges $0.50 per transaction, which is far less of a fee than others including PayPal charge (although personally, I never sweat those kind of fees, they are pennies in comparison AND they are tax deductible business expense that you get to write off at the end of the year which lowers your tax experience). 1) If you are billing a client over $1,500 on an invoice, they will need to be on IPN as well (you can bill guests up to $1,500 though). 3) To get approved you will need from 3 – 6 months of consecutive bank statements showing an ongoing minimum balance, the amount of which depends on what you expect to bill out via IPN each month. So, for example, let’s say you will be billing $2,500 a month via IPN. To get approved for an IPN account, you will need to keep a minimum balance of at least $5,000 in that checking account for 3-6 months. The minimum balance they’re looking for all depends on the amount you intend to bill and they have different tiers that you’d have to call them directly to find out what your amount would be specifically. But once you get approved, you don’t have to keep that minimum balance anymore because they don’t monitor your bank account. 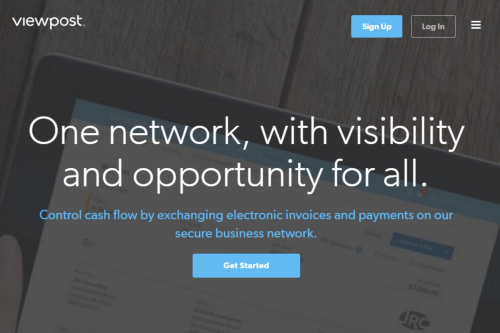 UPDATE: Intuit is discontinuintg their popular IPN (Intuit Payment Network) come April 2016. The company is encouraging users to move over to their Quickbooks-integrated merchant account product, Quickbooks Payments. There are two plans to choose from to fit your business, and you can also get mobile credit card processing if that’s of interest to you. Personally, I probably won’t be switching over as PayPal meets all my needs. It’s easy, I trust it, and the costs are comparable. 1 Comment Posted in Accounting & Bookkeeping, Best Biz Practices, Billing, Dear Danielle, Getting Paid, Technology. Bookmark the permalink. Here’s a video I made a few years ago to help people understand how billing by hour (selling hours) is keeping them broke and killing their business. This can be a difficult concept to understand at first. For many folks, it’s not until they’ve been in business for a bit that they realize the dilemma. It’s usually then that things finally “click” and they get it. Then, there are people who understand the problem immediately and want to avoid it altogether in their practice. 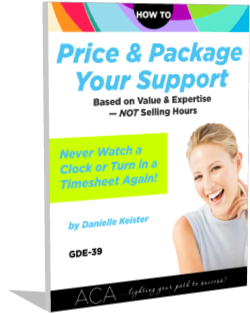 Whatever camp you’re in, my Value-Based Pricing and Packaging Toolkit will show you how to stop selling hours (and selling yourself short) and learn how to price and package your value and expertise instead. I’ve been practicing and studying this methodology since the 90s and been teaching it to our industry since 2004. I introduced the concept and adapted the methodology for our industry and I’m really the only person in our industry uniquely qualified to show you how to implement in your practice. 4 Comments Posted in Best Biz Practices, Billing, Earning, Financial Success, Getting Paid, Pricing, Value Is Not About Money. Bookmark the permalink. 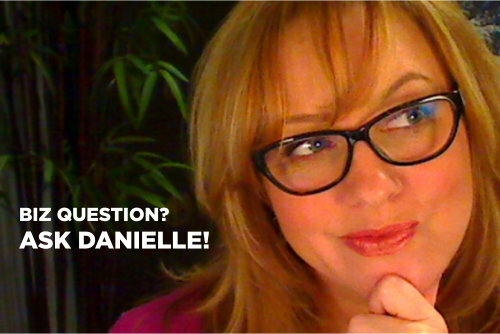 Dear Danielle: What Is a Retainer? This is a great question because it’s another reminder for us veterans that we can never take for granted that everyone knows what we think are commonly understood principles or details in business. So, the first thing I would explain is that a retainer is a monthly upfront fee paid in full and in advance of service. And the service for which retainers are charged in our business is a month of ongoing administrative support. The idea is that you and the client are entering into a relationship. With the retainer, they are securing a spot on your roster, reserving your time and preserving their priority over any other side (non retainer) clients or project work you do in your business. With retainers, they are generally billed with due dates of “on or before the 1st.” There are no “deposits” toward a retainer because it’s not a layaway plan. They either pay beforehand or they don’t receive services. In my practice, I have clients sign a credit card authorization form (AGR-30 in the Success Store) so that I can automatically run their credit card when it’s time for them to pay their retainer each month. So essentially, I pay myself, and my due date is the 25th of each month (and I never pay myself late, lol). if I happen to do billing for any clients (i.e., invoicing their clients on their behalf), I don’t have my business’s billing and theirs all trying to compete for my attention on the same day. If you are billing after the fact, that is not a retainer. For the reasons you recognize (and that fact that you’ll run into far more nonpayment issues with nothing to mitigate your losses), you will have all kinds of financial problems if you bill at the end of the month for services already rendered. The last thing you need to be in is the credit lending business (which is basically what you’d be creating by billing after the fact and waiting to be paid). How you bill in your business becomes part of your business management and systems for success. It should be given as much careful thought and consideration as every other planning and operational aspect of your business. This is also an example of the kind of things I will be sharing with attendees at my business management systems class this coming August 22. Check it out! 3 Comments Posted in Best Biz Practices, Billing, Business Management, Getting Paid, Policies & Procedures, Retainers. Bookmark the permalink. This is just one of the many issues you encounter when you price your services based on selling hours. You don’t know how long things will take going in and clients worry about their hours being frittered away and what their bill will be afterwards. Do you see how the focus is all on the time? Achieving results for clients should be the focus of your work, not watching the clock, having your hands tied behind your back and having to stop in the middle of things because time has run out. Guess what? When you learn how to utilize value-based billing in your business, hours don’t matter! No one needs to know upfront how many hours will be needed or used… because the focus is on accomplishing the work and achieving the goals and objectives it is in support of, not the hours. With value-based pricing, it doesn’t matter how many emails are sent back and forth with clients or how much time is spent reading them… because they aren’t paying for time and you aren’t selling hours. EVERYTHING from your conversations with clients, to your work, to your administration is soooo much simpler and more streamlined when you utilize the value-based pricing methodology. And clients are more attracted to this way of billing and working together. When you utilize value-based pricing, it’s much easier for them to say “yes” to working with you! This is what I’m teaching this month in my Value-Based Pricing & Packaging class on June 27 & 28: How to Price & Package Your Retained Support Based on Value and Expertise—NOT Selling Hours! I’m going to show you with step-by-step instruction how to price and create value-based packages custom-built for each client’s unique needs that make working together a breeze (not to mention help you earn better)! The Early Bird discount is over, but you can still get in on some savings. Register by June 9 and pay the special rate of $147 (a savings of $50). 3 Comments Posted in Best Biz Practices, Billing, Clients, Earning, Getting Paid, Great News!, Learning, Pricing, Working with Clients. Bookmark the permalink. Dear Danielle: How Much Should I Charge This Client? Unfortunately, due to antitrust laws, I can’t tell you what to charge. That’s really something you have to come up with on your own according to how you value yourself and what your business needs. I will say though that anytime you start itemizing individual, line-item tasks and assigning a hierarchy of importance, it has the effect of commoditizing yourself and what you offer. That’s not something you want to do in your business because it comes around and bites you in the rear when you need for clients to understand that the value isn’t in the tasks, it’s in how the tasks help them move forward in their business and what those tasks allow them to accomplish or gain or achieve. When you understand that perspective, you see that there’s no reason to itemize or value one task as more or less important–they are ALL important to the big picture of the client’s business. If you haven’t yet, be sure and download our Pricing Calculator and go through those exercises. This will help you get clarity around what you need and want to earn in your business. Base your decisions around that, not bending over backwards to customize your entire billing structure and business operations for one client. The tail will forever be wagging the dog otherwise (that is, the business and clients running you, instead of properly the other way around). You’ll never build an ideal practice that way. 5 Comments Posted in Articulating Your Value, Best Biz Practices, Billing, Business Management, Clients, Consulting with Clients, Dear Danielle, Earning, Financial Success, Getting Paid, Ideal Clients, Pricing, Working with Clients. Bookmark the permalink.